This Eurocube bath tap with diverter for bath / shower is delivered in combination with a hand shower, wall mount and shower hose. The tap has a robust angular design, which is best suited for a modern bathroom with lots of straight lines and angular shapes. 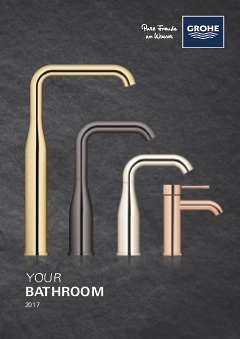 The set is equipped with the equally robust GROHE StarLight coating. The tap is easy in use, thanks to the GROHE SilkMove technology, which allows you to smoothly and accurately set the water volume and temperature.